Chiffon. Lace. Scalloped edges. If you've been looking for a vintage-inspired formal dress, look no further because this one is calling your name! The ruched waistband is absolutely flattering and modest on every figure; three quarter length sleeves and long maxi length make this dress easy to wear and yet so formal at the same time. 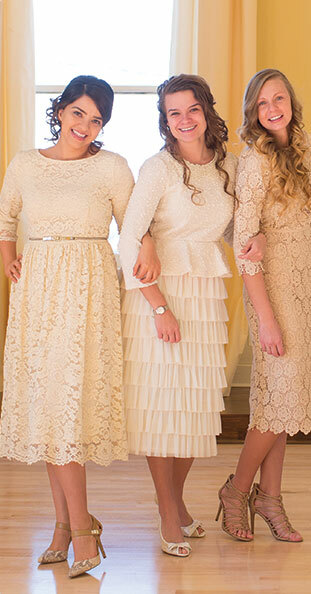 Perfect as a modest bridesmaids dress! Back zipper closure. X-small is only available in the lilac and jade. This Dress runs about a size smaller. Please consider ordering a size larger. Model in magenta wears size small in Dainty Jewell's. Model in plum wears size large in Dainty Jewell's. Model in cream wears size small in Dainty Jewell's. Model in black wears size medium in Dainty Jewell's. Model in navy wears size small in Dainty Jewell's. This dress fits perfectly on me. I bought it as a bridesmaid dress for my friends wedding and I’ve never really bought clothing online before because I worry about it fitting but it was perfect. The color was exactly what I expected it to be. And the bride is happy with it as well. I absolutely love my dress. It is so refreshing not to have to make alterations such as adding sleeves, material at the neckline, or trying to extend the skirt. Since I am only 5’ 3” we did have to shorten it a little, but it wasn’t too difficult. This is honestly the best made dress I have ever owned. I definitely recommend it for banquets, weddings, and formal occasions. This a beautiful dress. It was just what I expected it to be! This dress is gorgeous! Being a mom of two people I love, love dresses and this dress is so dainty with the lace top and the willowy chiffon bottom! The dainty jewel team is amazing! If your considering trying one of their awesome designs I highly recommend! My niece is in love with this dress and is so excited to wear it for her Bat Mitzvah party. this gown is what my niece wanted for her party and she looks so mature in it. I do wish that it was a little fuller. My daughter got this to wear to a modest church prom. It was beautiful! Excellent quality and fast shipping. Would definitely buy from Dainty Jewells again. Thank you for the gorgeous dress.